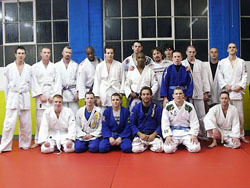 Welcome to Ultimate Jujitsu, the martial arts website for instructors, students, and fans alike. Ju-Jitsu is a fantastic art and will keep you hooked for many years, enabling you to try variations on the art. Jujitsu, also known as Ju Jitsu, Ju Jutsu, and Jiu-Jitsu, is an ancient martial art used by the Samurai warriors of war-torn Japan. The art itself consists of punches, kicks, throws, ground-grappling, and weapons. Jujitsu techniques rely heavily on leverage, so you don't have to be extremely strong to train. Once applied there's nowhere to go to escape this brutal sleeper. Twisting heels and knees - one technique to practice slowly! Traditional Jujitsu or Brazilian Jiu-Jitsu? This site provides you with the chance to learn traditional Jujitsu moves in the form of pictures and full descriptions. Brazilian Jiu-Jitsu (BJJ) is a slightly modified version of the art, developed in Brazil by Helio Gracie where more emphasis is placed on takedowns and ground-grappling. We also have a whole section of Brazilian Jiu-Jitsu techniques, but still in the same format as our traditional jujitsu techniques. We've now got a nice chunky section for beginners looking for more information on Ju-Jitsu and some of the terminology you may come across as you start training. 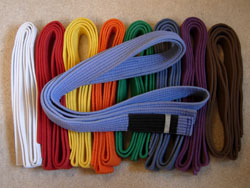 Whether you want to know about the different Ju-Jitsu Belts or more information about the Ju-Jitsu uniform, we've got it all covered.